Twenty-six years ago, Jane Golden took to the streets of Philadelphia with paint, brushes, and a small contingent of helpers with the goal of wiping out the city’s ugly graffiti. Today, 3,000 walls later, her work has become the nation’s largest public art program, a public-private mix of artmaking, art education, and art-as-therapy, with a staff of 50 -– many of whom are former graffiti artists themselves. Jane reached out to graffiti writers to redirect their energies from destructive tagging to constructive mural painting. She was impressed by their raw artistic talent and their self-taught knowledge of art history. She recognized the amazing creative force they represented, and began to provide opportunities for them to channel their creative talent into mural-making. Mural painting also provided a support structure for these young men and women to refine their artistic skills, while empowering them to take an active role in beautifying their own neighborhoods. “The results of the program were nothing less than magical,” says Golden from the website, muralarts.org. 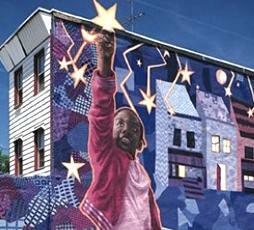 Mural-making not only changed lives but the murals themselves began to mend the aesthetic fabric of an industrial city struggling with decades of economic distress.